Milestones. We all have them throughout our individual lifetimes. These life events deserve recognition. There is no better time than the present to acknowledge and celebrate them as they occur. The start of a new school year is such an occasion, and many of my friends on social media celebrated that event. 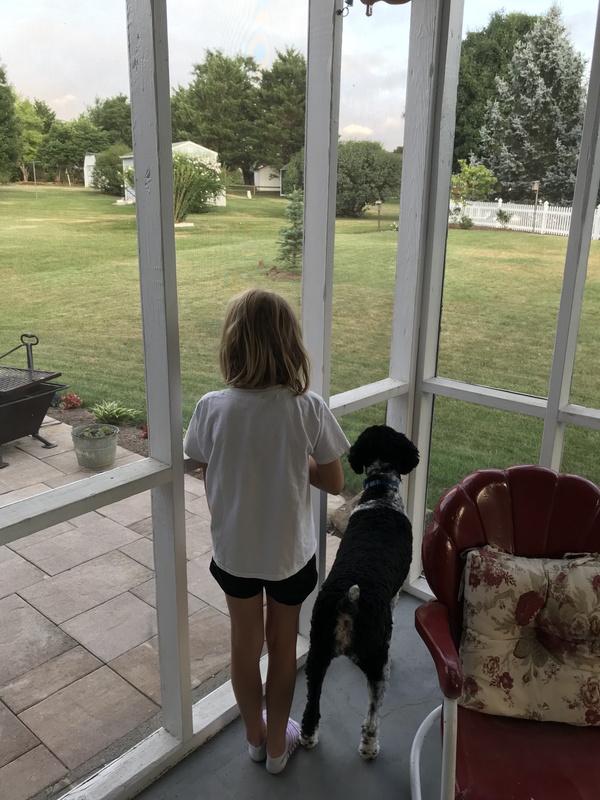 Multiple posts of children and grandchildren heading off for the first day of school were shared. Our oldest grandchild is a child no more. Evan began his high school experience as a freshman recently. His younger brother, Davis, entered his first year in middle school as a sixth grader. Our granddaughter Maren started third grade at her elementary school. Three students, three different schools, three different time schedules. That’s a family milestone with crisscrossing ramifications. Neva and I are glad we’re close by to help weave the way through that tangled web of unfolding activities. 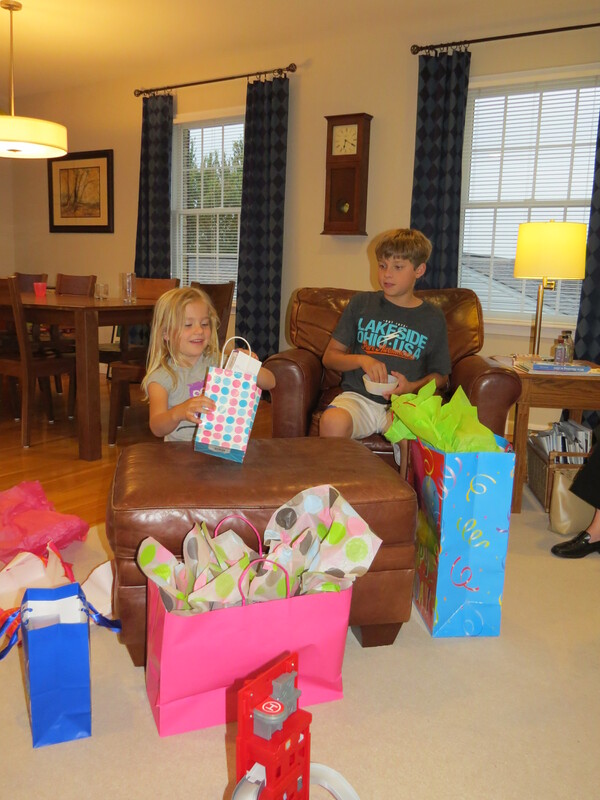 Disbelief overtook the significant adults in the lives of the three grandkids. How did we reach this place in time already? Evan, Davis, and Maren just took it in stride as if it were just another day at school. Perhaps they are the wisest of the group. With Labor Day upon us, I’m also reminded of the importance of vocational milestones. Being recognized for loyal service to a company for an extended period of time is an honor. Some businesses do a marvelous job of employee recognition while others not so much. Knowing I had spent my first career as a public educator, a friend asked me about my favorite memories of school. Walking those school hallways for 30 years, I wasn’t sure how to answer at first. I had had so many enriching and endearing personal experiences that I hardly knew where to start. First of all, I loved my jobs as a teacher and then as an elementary principal. Both positions were most assuredly milestones on my timeline of life. I remember the joy of watching my very first students file shyly into the fourth-grade classroom, unsure of how to react to their very first male teacher. Given the characters in that crowded classroom, it didn’t take long for their various personalities to emerge. As a principal, the first day of school was a joy for me. Much of my energy and that of the support staff went into preparing for that day to ensure a smooth start to another school year. 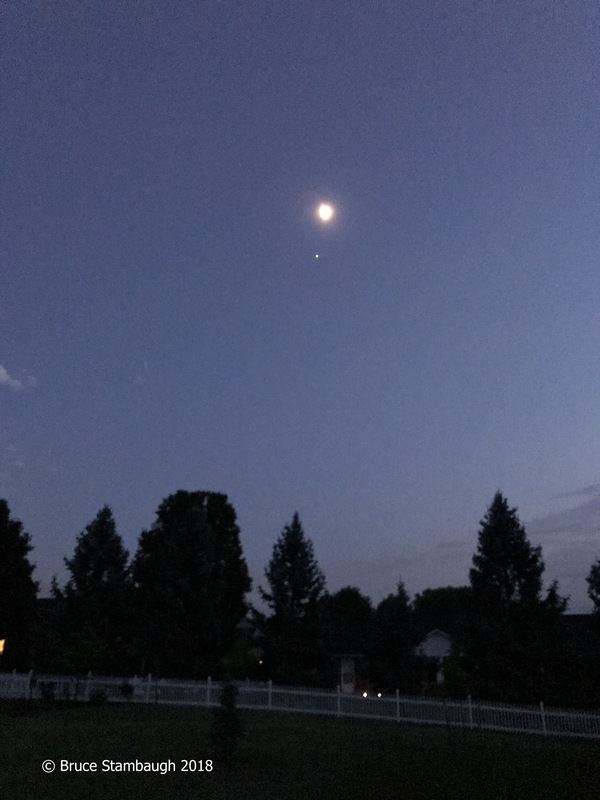 As I reflected further, though, I realized that the most important milestones for me weren’t the first or last days of school. No, the many precious moments on particularly hectic, stressful days are what enriched my life the most. The significant memories for me were the touching ones. Gold watches can’t compete with group hugs from sweaty, sticky kindergartners returning from recess. Anniversaries, birthdays, retirements, promotions, owning your first home, completing your first marathon race, competing in the special Olympics are but a few of society’s valued milestones. But for me, the most cherished ones can’t be memorialized in any material or monetary form. 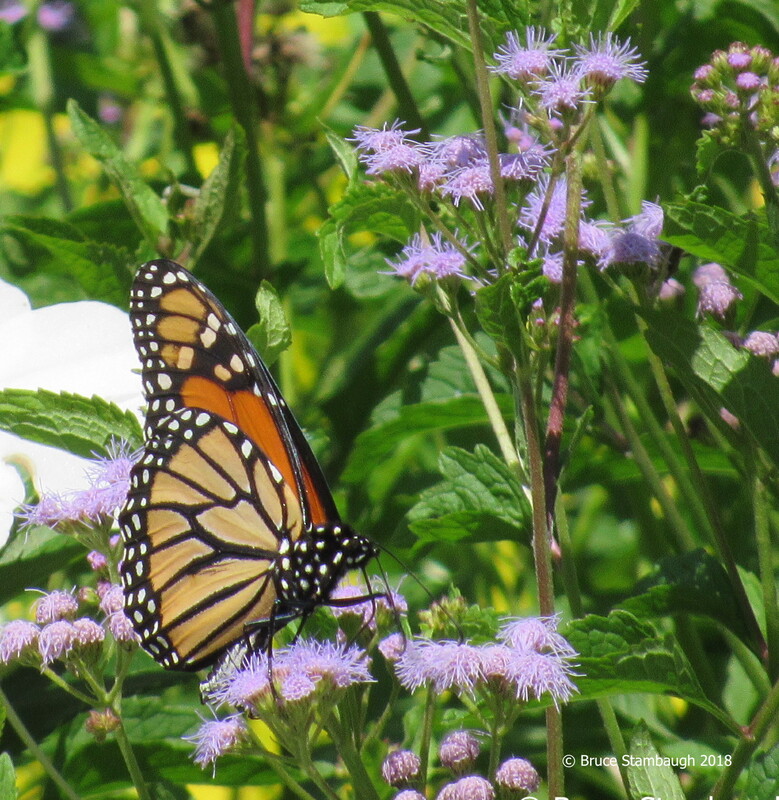 A Monarch butterfly making a fuel stop. The milestones that mean the most are at hand in everyday life happenings that we all experience. A monarch butterfly refueling on a sunflower. The unexpected grasp of a child’s hand around your finger. The moment the full moon peeks over the horizon. A bright double-rainbow arched in the sky after a fierce thunderstorm. These are but a few of the highlights that I cherish. What are yours? I learned long ago if you want to celebrate you have to relate and communicate. The designated time to do all three in the Unites States is upon us. Thanksgiving Day is a time to reflect on moments and people for which you are thankful, and to affectionately share that gratitude. When a situation goes awry, or a snafu in a bond develops, it’s important that we communicate our feelings to maintain positive relationships. It just might help untangle the problem and any hurt feelings. This Thanksgiving season I thought it appropriate to share some personal experiences I had this year that required communication to keep relationships strong. I call them vignettes of thankfulness. “I’ll see you in six months,” the doctor told my friend Leroy. A few months earlier, Leroy had been diagnosed with a type of incurable cancer. Leroy had decided to accept his fate, and forgo any treatments, which would only extend his life a couple of months. Instead, he relied on doctor approved vitamin supplements and his faith to carry him forward. I could hear Leroy’s voice quiver when he called me with a medical update. He was ever so grateful for this good news of extended life. I teared up too. I was honored to have received Leroy’s good news call. The call about a cement wall of all things had a similar ending. While I was away, a township resident had had a concrete wall poured for his new house. The problem was it was on the township right of way. As a township trustee, I was charged with getting the problem corrected. I hated to tell Bert, a man I knew well, to move the wall. But move it he did, both efficiently and creatively. My friend Bert used his foresight and imagination to recycle the wall. A craftsman sawed it into two pieces. A giant crane hoisted them into a new location, where they became a retaining wall. Bert seemed even more pleased than me. “We don’t often get second chances in life,” he said. I heartily agreed. I expressed my thankfulness for Bert’s willingness to correct the mistake and giving the wall a new life. The error did not become a wall that would interfere with our good relationship. My wife and I thoroughly enjoyed our extended time in Virginia’s Shenandoah Valley helping out our daughter as she coached her university’s women’s volleyball team. To those who know my wife, it was no surprise Neva worked night and day completing every day, necessary chores in our daughter’s household. While I was available, I helped our kindergartener granddaughter with her homework by listening to her pronounce letters and count numbers in both English and Spanish. For me, those were precious moments. With our travels, Neva and I made a hard decision. We needed to sell the cute cottage my folks had built 40 years ago on a fishing lake in southeast Ohio. We asked around, but no one in the family indicated an interest in taking over the cottage. After showing the property to some prospective buyers, our son called to say he had changed his mind. He wanted to purchase the cabin. Neva and I were thrilled. It was the first item on our downsizing list, and our son would be the new owner. I’m pretty certain I saw my folks smiling down from heaven the day the property transferred. Thanksgiving is a time to celebrate, communicate and relate the moments and emotions for which we are grateful. These are a few of mine. What are yours? 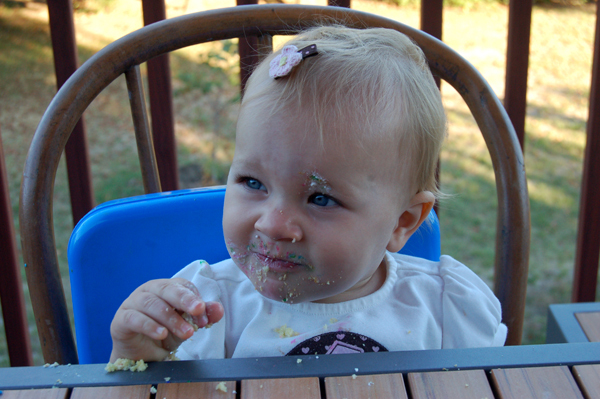 Cake and ice cream are the traditional birthday party favorites. © Bruce Stambaugh 2014. Some people cringe when their birthday rolls around. They look at the annual demarcation as making them one year older. Indeed, it does. Conversely, I prefer to think of birthdays as the beginning of another new year of opportunities and wonder. Sometimes birthday cakes are not always “cakes.” © Bruce Stambaugh 2014. That approach may have come naturally. Ever since I can remember, birthdays have always been important in our family. My brothers, sisters and I joyfully anticipated our special day. Our poor, already overworked mother would bake the cake we wanted. Even though chocolate was my favorite, I always asked for pineapple upside down cake. I had my reasons. I loved pineapple. I also loved maraschino cherries. The citrus and syrupy sweet flavors melted into an irresistible caramelized topping that made the yellow cake extra moist and pleasing. I have to confess that I also had a secret reason for requesting that cake. My other brothers and sisters didn’t like it as well as I did. You know what that meant? I downed more than my fair share of my cake all by myself. Though our family was never rich, that didn’t mean we didn’t celebrate. It took love, not money, to make birthdays special. Every once in a while, each of us five kids was allowed to have a real birthday party. That meant a bunch of rapscallions whooping it up until the cake and ice cream were served. Birthday presents. © Bruce Stambaugh 2014. 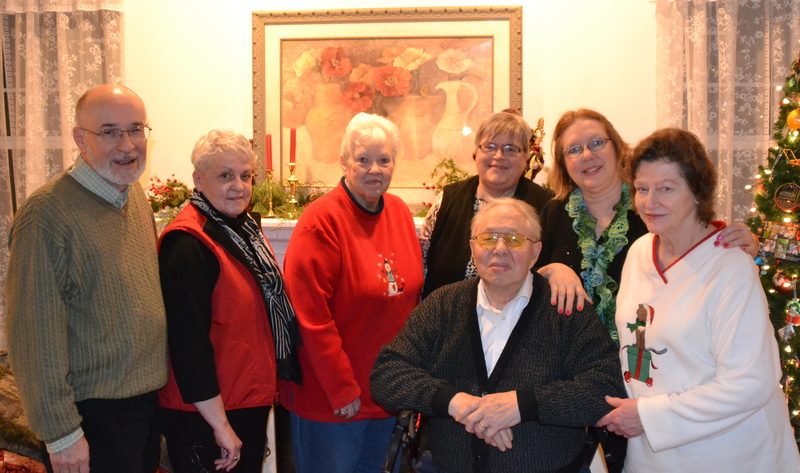 Usually, though the parties were confined to the immediate family. The cake naturally served as dessert for the evening meal. After dinner, came the present. What should have been an exciting time didn’t always turn out that way. For my 16th birthday, my folks got me a car, a toy car. I didn’t know whether to laugh or cry. That may have been the consequence of having a birthday sandwiched between Thanksgiving and Christmas. I always suspected that my parents bought what they could afford and thought I needed, needing to save for Christmas. On the other hand, having been born in December made the birthday tradition at my elementary school pretty easy. Students were expected to bring a treat on their special day. I often handed out store bought Christmas sugar cookies, stars, wreathes, and candy canes sprinkled with red and green sugar, to the joy of my classmates. Birthdays were equally greeted with cake and occasional parties in the home in which my wife was raised. 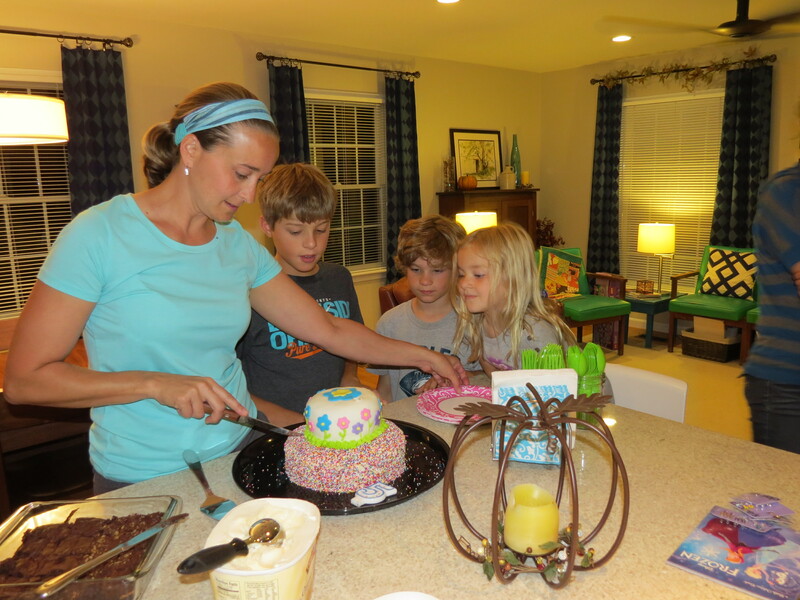 One year a neighbor made her a cake so pretty the family froze it instead of eating it. We tried to make our own children’s birthdays special, too. Neva pulled out all the stops to make or buy special cakes, often in the shapes of baby dolls or baseballs or whatever our son and daughter fancied. Of course, they had parties with friends, neighbors and relatives some years, too. There is only one first birthday. © Bruce Stambaugh 2014. This year I get to celebrate my birthday, never mind which one, with my three grandchildren. They live in Virginia’s Shenandoah Valley, a place that is lovely any season of the year. I’m really looking forward to the time with the grandkids since my wife and I don’t get to see them regularly. 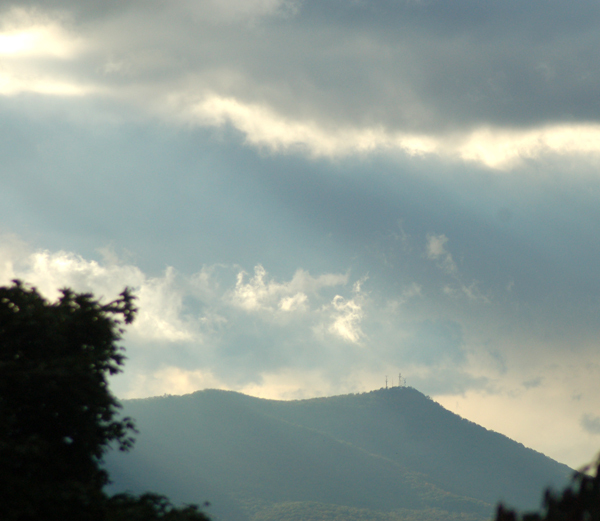 Our home is west of the Appalachians, and theirs is set on the mountains’ eastern foothills. I’m sure they will enjoy watching me blow out all those candles. I just have two birthday wishes though. I hope my array of burning birthday candles doesn’t set off their fire alarm. And I hope they don’t like pineapple upside down cake. Christmastime is gathering time. The very origins of the holiday make it so. Though we may not think about it, those who gather in celebration replicate the inexplicable cast of characters that assembled for the first Christmas. Paying homage for this special birth, their lot represented a cross-section of social, political and religious backgrounds, not unlike today. To be sure, they were a motley bunch, unassuming, even unaware of the tradition being created. Of course, we have no way of knowing the exact date or even time of year for the birth of the Christ child. We can only follow the story as it has been transcribed and translated for us. Over time, the traditions of Christmas have been handed down and culturally adjusted to fit the changing times. There’s no documentation for tinseled evergreen trees or a jolly St. Nick in Bethlehem that ancient night. An angelic troupe serenaded stunned shepherds huddled in a field, watching over their flocks. Astute individuals, long on the lookout for a messiah, offered praise and prayer. A ruler trembled. Later, wise kings traveled from afar to worship the boy, and offered precious gifts. Mary and Joseph themselves were among the throngs reassembling in their hometowns on governmental orders of the day. Harsh as their journey may have been, they complied. History wouldn’t be the same if they had not. Centuries later millions travel by modern means to celebrate Christmas, and not always on Dec. 25th either. That fits the Advent model as well. Perhaps, because of schedules or availability, you have already gathered for the holidays. 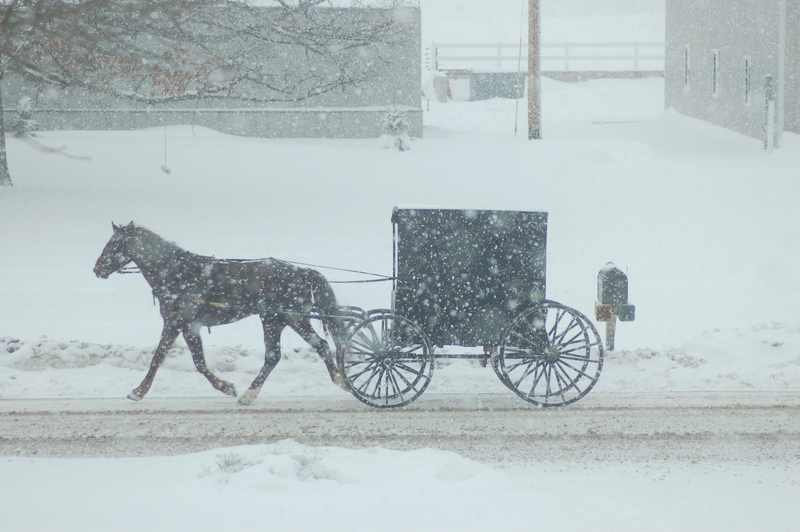 Here in the largest Amish population in the world, both traditional Christmas Day and the more reverent Old Christmas, always Jan. 6, will find families and friends gathering and sharing food, fellowship, and gifts. 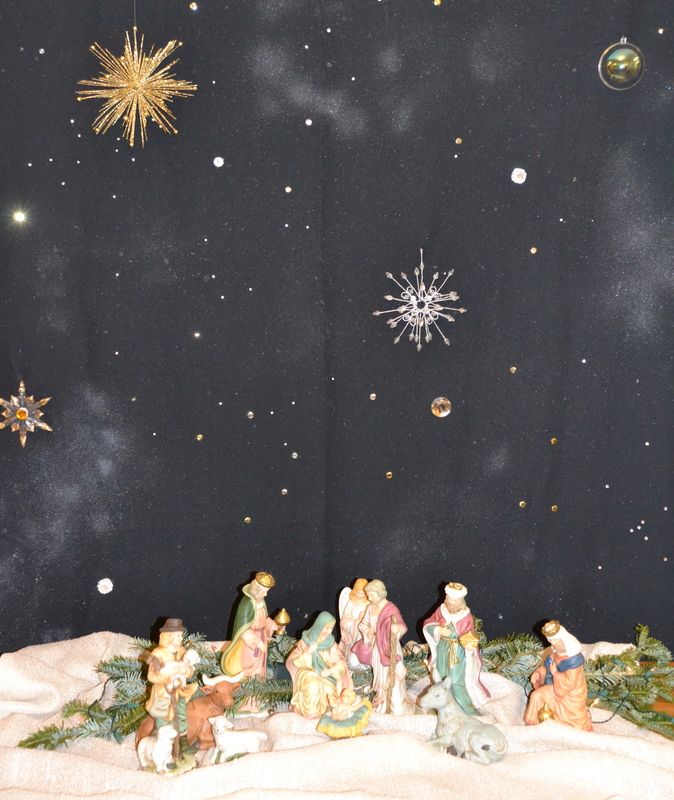 You might know Old Christmas as Epiphany or Three Kings Day. Our own families will make merry on several occasions. Christmas Eve morning two kinships are blended into one for a festive breakfast, a holiday custom spanning three decades. On Christmas Day, we’ll repeat the family ritual of enjoying a tasty holiday meal, and opening gifts. Those traditions have been toned down a bit from my childhood days when my good parents splurged beyond their means to make Christmas merry. Some of us will eat tofu instead of turkey or ham, and the gift giving has been reigned in as well. We set a reasonable spending limit, pick a name out of a hat, and that’s that. Of course Santa still fills the stockings hanging from the fireplace mantel. Later, the five Stambaugh siblings and any available family members will met at our little sister’s home to honor the season and our folks. 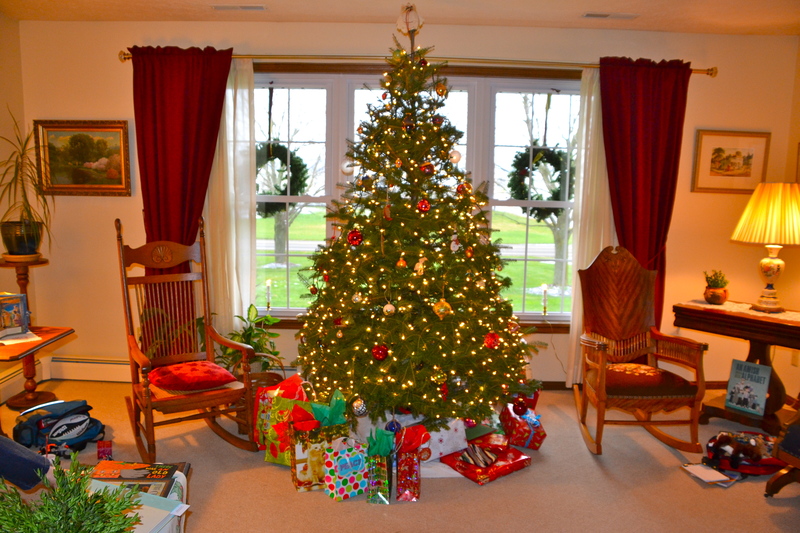 After all, Mom and Dad instilled in us a fervent love for Christmas. Myriads of global families will mirror my own, each in their own traditions and styles. Others have already gathered to bake cookies, or attended school programs, or a holiday concert. Still others packed food and clothing for the needy or served meals to too many homeless peoples around the world. A curious collection of peoples was drawn to that original anointed Nativity scene. Once the event’s date was arbitrarily fixed as Dec. 25, families have been assembling ever since. Centuries later, Christmas is still for gathering. The modes and means of doing so may have changed, but the reason has not. In that, let us all rejoice and be glad that we can gather together indeed. 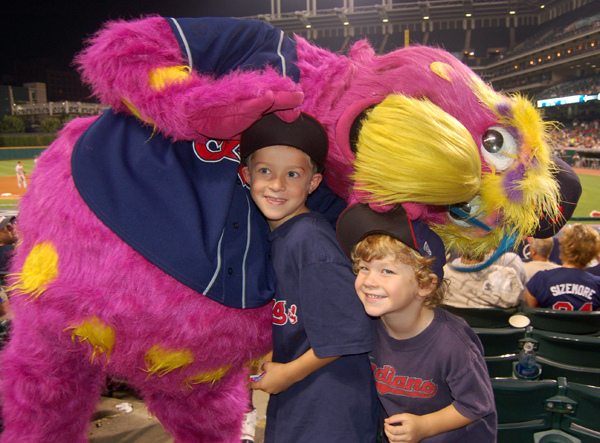 Slider pounced on Evan and Davis at a Cleveland Indians game in August. Every time I see my three grandchildren, I marvel at how much they have grown. I used to think that a lot when they lived in Texas, and we only saw them three or four times a year. Each time we visited, whether the venue was here or there, our Texan born grandchildren showed obvious changes. One would expect that given the infrequent gatherings. Massanutten Mountain dominates the Shenandoah Valley at Harrisonburg, VA. 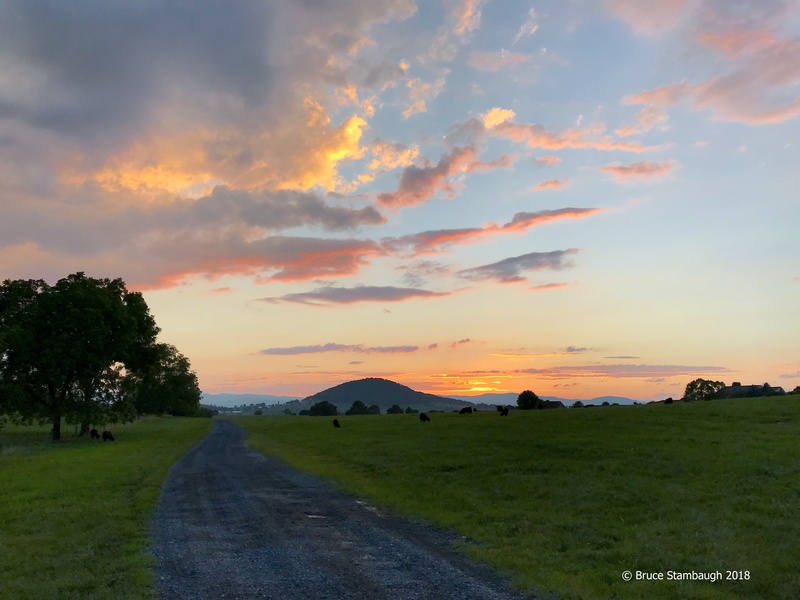 But now that they live in Virginia’s lovely Shenandoah Valley, I seem to find myself saying that to them and about them each time we see them. And compared to Texas, that’s been a lot more frequent. Since they moved from Pflugerville to Harrisonburg in mid-June, we have been together with Evan, Davis and Maren several times already. They have been in Ohio twice, and we have driven the 350 miles southeast four times. The visits included a couple of celebrations since two of those trips marked birthdays. 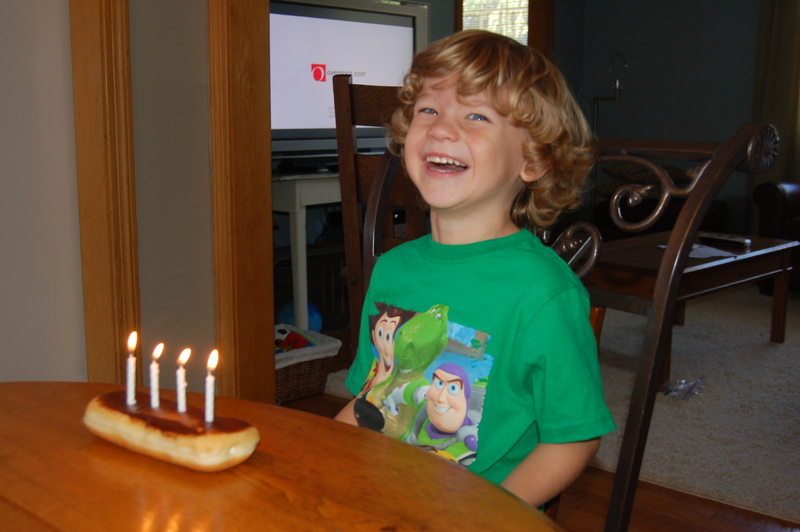 In July, we finally got to party with Davis on his fourth birthday. The Texas heat always discouraged us from mid-July visits, other than when he was born of course. We wouldn’t have missed that no matter how hot it got. 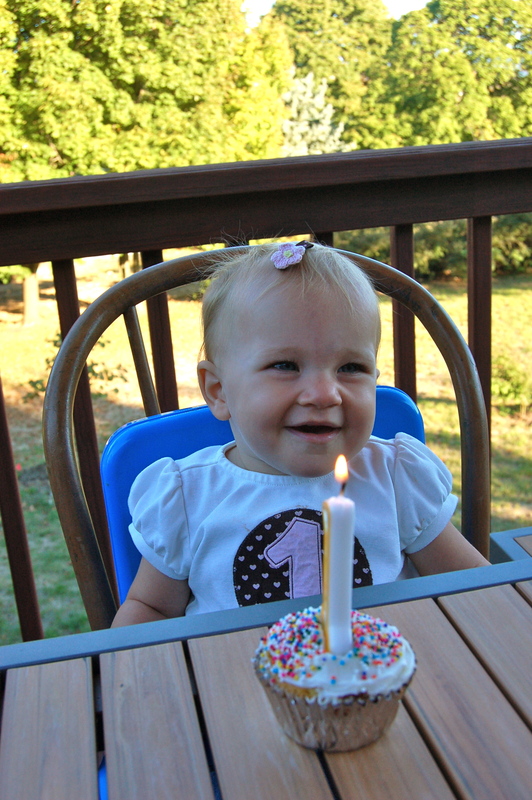 On our most recent trip, we celebrated Maren’s first birthday with a host of family and friends. It was quite the party. They may be living in Virginia, but their Texas roots run deep. Maren’s daddy couldn’t forget the good things about Texas. He bought a smoker and we had ourselves some swell tasting Texas brisket with homemade barbecue sauce. A field of Texas Blue Bonnets in full bloom. Joining in on Evan’s special day was never a problem. Flying to Texas in mid-April, when the gorgeous blue bonnets were often in full bloom, was always a pleasure. 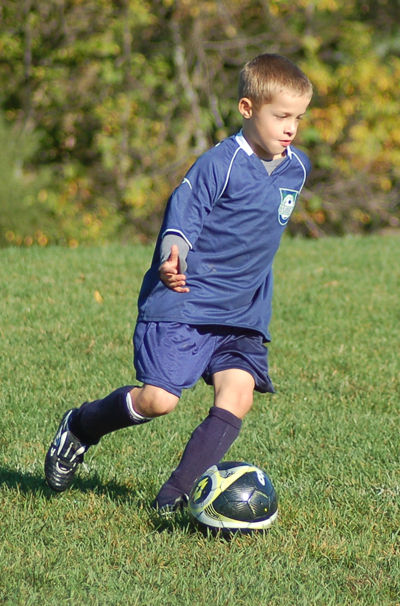 Grandson Evan on the move in a soccer game. Now all of that has changed. Evan is enjoying first grade and is growing like a weed. He is athletic, inquisitive, assertive, and definitely knows he is the oldest of the three. In other words, he is a typical six-year old. 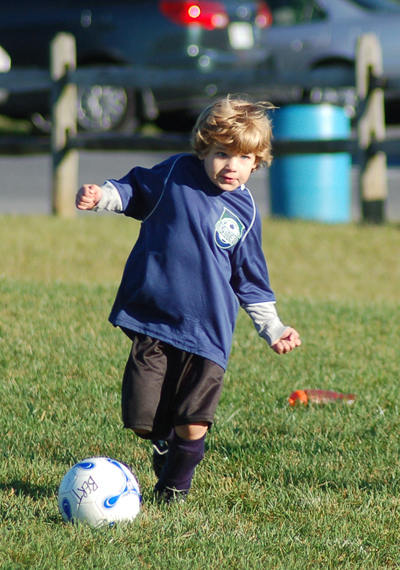 Grandson Davis was all concentration in his soccer match. Davis enjoys his pre-school three days a week. On our last visit, his bouncy, blonde curls had been trimmed back to manageable standards. That didn’t seem to deter getting the attention of the girls at his soccer match. A true lefty, no lines can confine his creativity. That included drawing with red permanent marker on the new tan bedroom rug. He can be a bit moody like his Nana. Nevertheless, it is a joy to be the brunt of his silly jokes. Playing along is all a part of being a grandparent. My favorite moment with the boys came when they spent time with us here in early August. Nana and I took them to an Indians game, where Slider, the Tribe’s fuzzy mascot, jumped the boys, much to their delight. 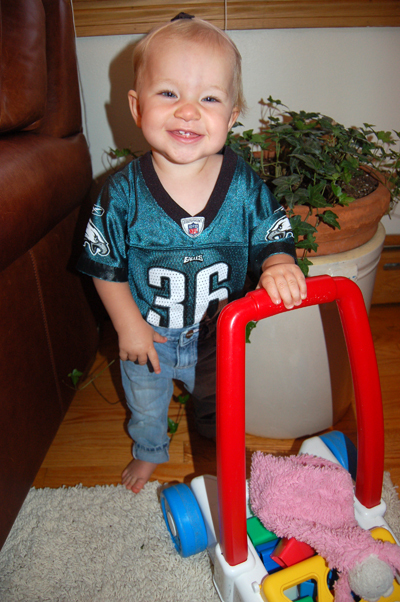 Granddaughter Maren was all dressed for the Eagles' game in her skinny jeans and jersey. Maren is the happiest baby I have even seen, unless of course she wants her mommy and her mommy is unavailable. Modeling might be in her future. She already poses for the camera. By definition, Maren is really a toddler now that she has passed her first birthday. Close to walking, Maren stands by herself and never tires of pushing around the toy cart Nana bought her. With those sparkling baby blue eyes, that constant smile and gregarious demeanor, Maren is already a knock out. At the rate she is growing up, I may be called into Virginia guard duty sooner than I think. 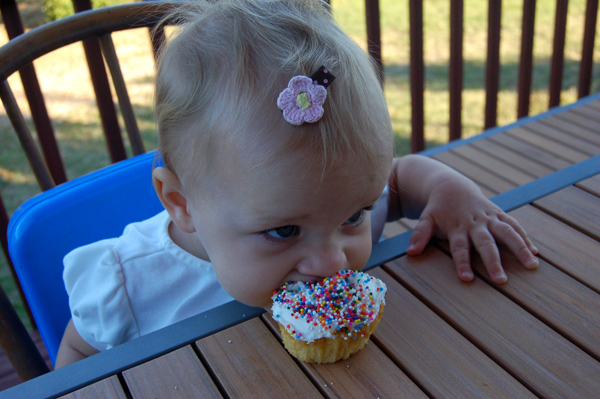 Since it was her first birthday, Maren wasn't too sure what to do with her first cupcake. In the end, Maren figured out what partying was all about.